Interlocking pavers are concrete tiles that can be placed together to form walkways, decking, patios or driveways. They fit tightly next to one another and can be arranged in a variety of different configurations to match any size or shape. Their interlocking feature makes them easy to install on your own. They do not require any grout or mortar to set. Since they are not anchored down, they can also be removed and rearranged at a later date. It provides an extremely versatile solution to all of your patio needs. There many different types, shapes, and styles of interlocking pavers that you can use. These range from hexagonal shapes to rectangle bricks, all of which can be arranged together quickly and easily. High-quality pavers are affordable and easy to install on your own. They do not require any special experience or hard-to-find tools to set them up. Best of all, you can easily correct any mistakes that you make along the way. Pack them together tightly and evenly say can end up with perfectly set up interlocking pavers for your patio. 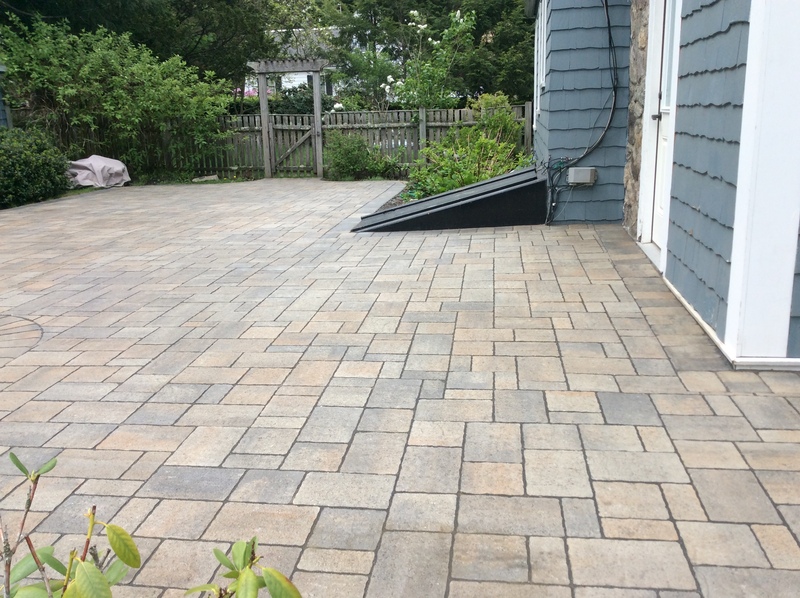 The first step in installing interlocking pavers for your patio is to clear out the area that you will be setting your pavers on. Dispose of any leftover debris in the area to prepare it for excavation. The next step is to dig out an appropriate base for the pavers. You should dig into the ground at least 8 inches deep and level across. When you are excavating the clearance for the pavers, there should not be any holes or dips in the ground. Minor imperfections are okay because it will be filled out with the correct base material in the next step. As you excavate, you should also ensure that the ground has an appropriate pitch that slopes away from your house. This will help keep water away from your house. Next, apply a sheet of fabric on the ground to prevent weeds from growing up through the pavers. Weeds can deform your pavers over time. This fabric base helps to prevent that from happening. Next, install 5 inches of crusher run evenly across the ground. Add this a few inches at a time. When you add each inch or two, go over it with a heavy duty plate compactor to ensure that it is packed tightly into the ground. Over time, this road base will settle. If you do not pack it in tightly, it will cause the pavers to become uneven as it settles. Once the crusher run is packed down tightly, lay 1 inch of course bedding sand over top of it. This will provide a nice soft surface for the pavers to settle into. Now it’s time to start building your patio pavers. Start at a corner and carefully build them out until the entire area is covered. Once the pavers are laid out, add plyometric sand along with it. This sand will create a tight seal between the pavers and prevent weeds and insects from getting into the cracks. The sand expands over time, which creates a tight seal and prevents anything from getting through the cracks. Now your patio is complete. 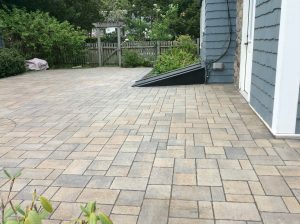 Give it a simple sweep to remove all of the leftover sand and debris and enjoy your new interlocking paver patio floor.